The IVIF staff provide expertise and guidance in experimental design, determination of the optimal radiopharmaceutical, development, validation and implementation of methodology for animal PET imaging studies, as well as data analysis and interpretation. The PET Laboratory at UPMC Presbyterian Hospital houses a Siemens Eclipse HP 11 MeV negative-ion cyclotron, which is configured with a dual beam extraction port and two 4-position target carousels, increasing the maximum number of mounted targets to a total of eight. Novel, literature or routine fluorine-18-labeled tracers can be produced for imaging with the Siemens Inveon scanner at UPMC Hillman Cancer Center. Carbon-11 tracers can be produced for imaging in the PET scanners at UPMC Presbyterian Hospital. [18F]Fluorodeoxyglucose (FDG) is available for animal studies on a daily basis. In addition, [11C]Acetate, [11C]Choline, [11C]Methionine, [18F]Fluoroacetate, and [18F]Fluoroestradiol have been synthesized and are available for small animal imaging experiments. Larger biomolecules, including peptides, proteins (e.g. monoclonal antibodies) and nanoparticles can be radiolabeled with non-standard positron emitters such as copper-64 (T1/2 = 12.7 h) and zirconium-89 (T1/2=78.4 h) for small animal PET-CT imaging. Gallium-68 (T1/2 = 68 min) will be available through a 68Ge/68Ga generator in the radiochemistry laboratory at the Hillman Cancer Center for labeling rapidly clearing biomolecules. 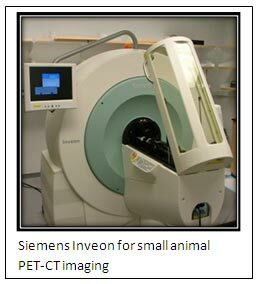 Animal research scanners are located in close proximity to the PET cyclotron-radiochemistry laboratory at UPMC Presbyterian Hospital, facilitating new radiotracer development and evaluation. Additionally, a small animal PET-CT scanner at the Hillman Cancer Center is located adjacent to a radiochemistry laboratory. 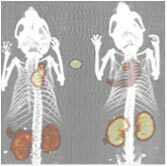 At the UPMC Presbyterian Hospital location, the microPET and CereTom scanners have been coupled such that images from each instrument are intrinsically co-registered to enable small and large animal PET-CT capability. The PET experts offer consultation services to investigators, to discuss specific research objectives and the appropriate PET imaging protocol. Consultations include guidance in experimental design, development, validation, and implementation of methodology in the interpretation of study data. Please contact Dr. Carolyn Anderson for more information or to set up an appointment regarding your preclinical imaging studies.